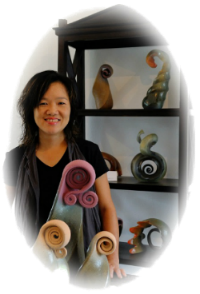 inclination with clay was form 1998 and began her creative career since 2008 where she gave up her lucrative job to pursuit her passion in arts. Her artworks displayed her strong affinity to nature and earth, where she creates clay sculptural forms inspired from flora and fauna. A self-taught artist of great ingenuity, her works are a visual harmony on colours, textures and a composition of her sensibilities towards nature.